Since the last update of the module functional for Moodle authorization held for about six months, and even then there were ideas to improve it, but the time to put these ideas appeared only in the last few days, some of which were spent on the implementation of these ideas. It should be noted that (pah-pah) for the time the plugin is in the official Moodle plugin repository users did not have any problems working with the one, questions usually dealt with factors not related to the functional unit, and it was more of a problem with the internal configuration of their server, for example, php settings. 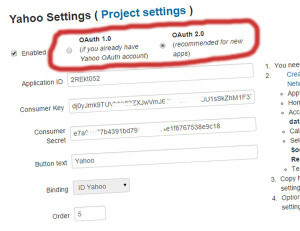 Recently, Yahoo has finally implemented OAuth2 protocol support, which is much easier and faster. 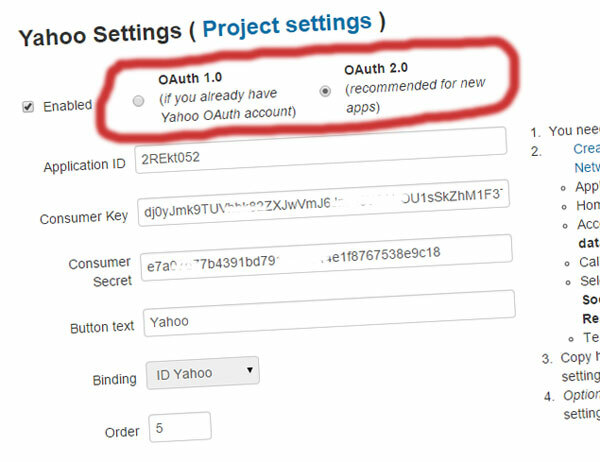 We decided to keep support OAuth 1.0 protocol requests for those who have already successfully operate old applications and made a special versions switcher of these protocols in Yahoo settings (the way it is included in the plugin by default! ), but we still strongly recommend to move your applications to OAuth 2.0 protocol. Next returns json-string that is converted to an array and LenAuth processing the one. This idea was for a long time: give Moodle user to construct authorization buttons/links output order. Now, in LenAuth settings for each service appeared the «Order», which allows to build your buttons output order, you just need to put the serial number of the desired output button. Please note that all figures in each service must be unique, and their value should be in the range of 1 to 7. The order by default is constructed as: Facebook, Google, Yahoo, Twitter, Vkontakte, Yandex, Mail.ru. Because the guest users are considered to be logged on, they did not show the authorization buttons is noticed Mark Samberg and plugin repository on GitHub threw Pull Request. We made it to the editing plugin, thank you, Mark! We have updated the version of the VK API with 5.27 to 5.33. In our view, the plugin is done everything that could be done, we have no new ideas, all implemented. Therefore, we will switch to writing documentation and debugging other our Moodle plugins, which we have operating time, because we are creating / programming / developing plugins for Moodle (blocks or modules). But if you have ideas for further improvements to the plugin, you can leave your idea in the section «Issues» of our repository on GitHub, and if you are a developer and already know how to implement your idea, then throw Pull Request.